As the 2014 election season came to a close many of us were left reflecting on our divisive political system. How did we come to a point where even the most straightforward of questions becomes politicized? With so many looming issues, from climate change, to the spread of disease, to international military conflicts, . . .
Let’s focus on the global warming issue, since the spread of disease and international conflicts seem to be beyond the Sierra Business Council’s ability to influence, nor are they critical Sierra issues. On the other hand they have taken on the mission of reducing greenhouse gas emissions in Northern California.
. . . following the Vision Awards Ceremony I found myself in deep conversation with a county supervisor, the head of a conservation group, and a fellow SBC staff member, discussing whether there’s any value in taking local action on climate change when the global picture seems so grim. In my mind there was a clear answer, “Of course we should be taking action at every level to mitigate and adapt to climate change, be it local, statewide, federal, or global, and preferably all four!” That, however, was the thinking of a naive ideologue, one that hasn’t experienced the ins and outs of funding local government action. It was a worthwhile discussion, one that seemed to have a profound effect on each of us at the table. One wonders who was the clueless “naive ideologue” at the table. The writer, SBC staff member, the conservationist, or the county supervisor? The SBC can discuss climate change all they want around the dinner table, but the facts remain there has been no global warming from the last 18 years, according to satellite measurements. 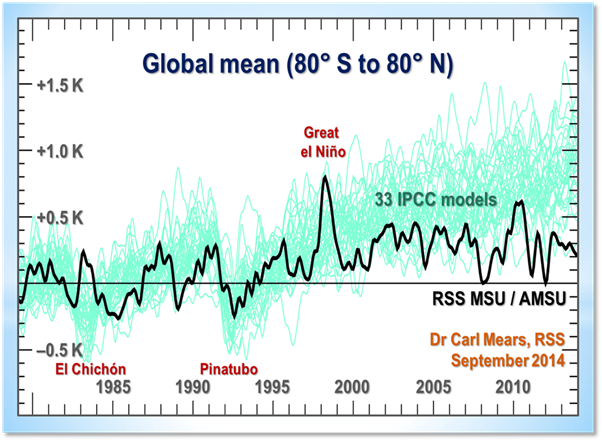 Output of 33 IPCC models (turquoise) compared with measured RSS global temperature change (black), 1979-2014. The transient coolings caused by the volcanic eruptions of Chichón (1983) and Pinatubo (1991) are shown, as is the spike in warming caused by the great el Niño of 1998. We could discuss how the general circulation models have failed to represent the real climate change. Who is the SBC going to believe, the models or the real world data. All the discussion at the SBC table cannot change the facts. No warming for 18 years while CO2 continues to increase. What is the connection? H/T to Sierra Foothills Report for the SBC article tip. Steven Frisch posted this at Jeff Pelline’s blog in answer to this post. There more, but let’s focus on my intent vs the perception, making most of the rest not relevant. Ray: I think the answer is really quite simple, Russ is not interested in a serious conversation and is incapable of engaging in one with real intellectual honesty, as evidenced by the fact that he glossed over the key point that Ms. Todd’s post was making, that we should be having these discussions, even between people who disagree, on a regular basis in order to find common ground on values. Russ elected instead to imply that Ms. Todd, representing SBC, was not factual. My answer: I did not imply that Ms. Todd was not factual, only that she missed the point, as did Steven. The validity of the climate change argument is not about seeking “common ground on values” it is about the facts. The point I was making is that all the talk around the table seeking common ground will not change the data upon which facts are based on. The satellite data shows no warming for the last 18 years. The surface record does show some warming, mainly from the urban heat island (UHI) influence on the historical climate records. Climate experts say that UHI barely affects temperatures, like the 21 lanes of asphalt at the Sydney observatory baking the adjacent thermometer. Over the past 20 years, surface temperatures in Sydney have risen about half a degree, while satellite temperatures in that grid cell have fallen. Bottom line is that talking about common ground on values will not change the facts of climate change. I will be glad to sit around the table and talk about the facts. This entry was posted in Analysis, California, Climate Change, Local. Bookmark the permalink. There is absolutely no way this year will get anywhere those record years on the satellite datasets, which is precisely why we will hear nothing about it from NASA, NOAA or the MSM. One of the problems of the BEST data presentation is that it did not address the urbanization that has taken place over the last 250 years, and the impact on temperature measurements. Once rural weather stations, are now surrounded by parking lots, buildings and other urban development like tennis courts that absorb energy during the day and influence night time temperatures. Thus Dr Muller papers on temperature have had problems passing peer review. In October 2011, despite the papers not being accepted, Richard Muller launched a major international publicity blitz announcing the results of the “BEST” project. I wrote to him and his coauthor Judy Curry objecting to the promotional initiative since the critical comments of people like me were locked up under confidentiality rules, and the papers had not been accepted for publication. Richard stated that he felt there was no alternative since the studies would be picked up by the press anyway. Later, when the journal turned the paper down and asked for major revisions, I sought permission from Richard to release my review. He requested that I post it without indicating I was a reviewer for JGR. Since that was not feasible I simply kept it confidential. On July 29 2012 Richard Muller launched another publicity blitz (e.g. here and here) claiming, among other things, that “In our papers we demonstrate that none of these potentially troublesome effects [including those related to urbanization and land surface changes] unduly biased our conclusions.” Their failure to provide a proper demonstration of this point had led me to recommend against publishing their paper. This places me in an awkward position since I made an undertaking to JGR to respect the confidentiality of the peer review process, but I have reason to believe Muller et al.’s analysis does not support the conclusions he is now asserting in the press. The BEST data for the stair step claim is flawed. The surface temperature data has increased due to human activities, but not CO2 emissions. The satellite data is more accurate, but we still need more that 18 years to see the larger trend. Checking, it does appear Stephen Frisch, CEO of the so-called Sierra Business Council (it is in the Sierra but it isn’t a council of businesses) flirts (or perhaps heavy pets) with libel against Russ Steele at Fortress Pelline, the Sierra Foothills Report, as a result of this piece. Regarding Dr. Muller, his BEST is shopping for grant money and being on board with the dominant funding paradigms helps in actually getting cash, but he is an honest player on the stage and is good about actually mentioning where his soft spots are. In the case of that op-ed, the money quote is “Most of us hope that global warming actually has stopped… Perhaps the negative feedback of cloud cover has kicked in, dampening global warming, or the ocean absorption of atmospheric heat is playing a new and more decisive role”. Muller knows, and most activists do not know, that CO2 is just a small positive perturbation of world temps; by itself, it only adds about 1.3C for a doubling, and by the computer models one needs at least 2C degrees for a doubling in order for *any* of the scary results resulting from runaway positive feedbacks (like a public address system shriek) to hold true, and it was with great fanfare that the IPCC AR4 last decade proclaimed the lower bound for CO2 climate sensitivity was raised from 1.5C to the magic 2C. It was with less fanfare that the lower bound was dropped back to 1.5C in the recent AR5 report; there were just too many inconvenient solid, peer reviewed papers that placed sensitivity at and below 1.5C to claim 2C. Muller writes, “Perhaps the negative feedback of cloud cover has kicked in, dampening global warming”, and that goes to the heart of climate alarmism… the GCM, general circulation models, all assume POSITIVE feedbacks from clouds and atmospheric water vapor, acting as additional blankets keeping heat in, while the negative feedback of more vapor creating more clouds reflecting more sunlight wasn’t coded into the models… they assume more water vapor doesn’t create more clouds, just more water vapor, the dominant greenhouse gas. If more low clouds are created, we get less sunlight hitting land and water and more sunlight reflected back into space. Lo and behold, we have the megabucks CLOUD experiment at CERN showing just how that appears to be happening under control of solar magnetic effects modulating galactic cosmic rays and we have (yes, peer reviewed in solid journals) a 540 million year record of ocean temperatures varying with the galactic cosmic ray flux our solar system is exposed to. We live in interesting times, and if the physicists paying attention to direct and indirect solar effects, radiance and solar magnetic, are right, we’re in for a cooling starting very soon as Solar Cycle 24, weak and waning, blends into Cycle 25 which some believe may be nearly non-existent, a Maunder Minimum part deux. The real experiment is running, the bets are placed. Better hope 25 and beyond aren’t Maunderish as billions could die with the collapse of winter crop yields. Good article. How do you respond to Prof. Richard Muller and his explanation that this fifteen years is just a “landing” on the staircase up? See http://www.nytimes.com/2013/09/26/opinion/a-pause-not-an-end-to-warming.html?_r=0.